I just spoke to Princeton's animal control officer, who told me that Princeton township's deer control program has markedly reduced the number of auto accidents involving deer. When the program was started, around 2000, there were 346 accidents involving deer. The number of accidents has been dropping since then, and has leveled out over the past several years at 70 to 90 accidents per year. What happens to deer that are killed by automobiles? There was a time when some of them were taken to Coventry Farm, where a lady used them to feed the vultures. She developed quite a following in the vulture community over time. These days, a contractor carts them away and turns them into fertilizer. I've posted some reviews of upcoming movies at the Princeton Public Library's Environmental Film Festival at my PrincetonProject blog, which deals with issues of sustainability in Princeton. 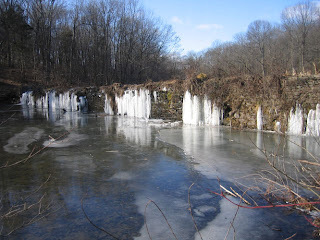 The recent cold spell made for lovely patterns of ice on the upper dam at Mountain Lakes Preserve. Warmed by the sun, these columns of ice were starting to break off of the face of the dam, as if from the face of a glacier, sending ripples of sound through the thin ice covering the lake. Tomorrow, Jan. 7 at noon, there will be a showing of Dirt! The Movie at the Princeton Public Library. The movie documents how vital and multifaceted our connection with dirt is. Though often treated as something inert and expendable, dirt is portrayed in the movie as teaming with life, utilized not only for growing food but also for play, spirituality, water filtration, home construction, pottery, and even energy production. Interviews in India, Africa and the U.S. provide a broad portrait of how dirt is used and related to in different cultures. I'll give a short presentation afterwards about local soils, including some surprises about how gardening values like fertility and earthworms don't necessarily translate well to lands dedicated to preserving biodiversity.